Spending my childhood summers in Pennsylvania I spent a considerable amount of time on the Susquehanna River watching those famous black GG-1s of the Pennsylvania Railroad streak up and down the east shore between Harrisburg and Baltimore. Unbeknownst to me at that time was the existence of a much smaller and somewhat slower railroad on the west side of that same river. The roots of this railroad go back to the 1870s with the intention of connecting the coalfields of Broad Top with Philadelphia. After many mergers and acquisitions, the Maryland & Pennsylvania Railroad emerged in 1901 connecting Baltimore, Md., with York, Pa. Although never materializing as a coal hauler, the Ma & Pa, as it was affectionately known, was more of a bridge line between the Pennsylvania RR and the Western Maryland RR in York and the Pennsylvania and the B&O in Baltimore. On line traffic was also very important, consisting mainly of passengers, milk, slate, furniture, cigars and cigar boxes. The Ma & Pa served as many as 50 businesses in York alone. The backbone of its passenger service consisted of two northbound and two southbound mail trains daily across the entire line. Of the 57 station stops on the Ma & Pa one of the busiest was in Hartford County, Md., in the town of Bel Air. Situated at milepost 26.5 (from Baltimore), Bel Air is located about halfway between Baltimore and the Pennsylvania border. Between 1700 and 1725 the land around Bel Air was cleared and inhabited, but it was not until 1780 that the town of Bel Air was actually laid out. In 1845 Welsh quarrymen started entering the county to develop nine different slate quarries, which would later add a considerable amount of traffic along the Ma & Pa. Eighteen quarries in all dotted the west bank of the Susquehanna. 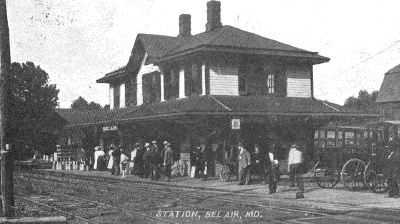 In 1874 the town of Bel Air was incorporated, about the same time as the first railroad entered the county, one of many predecessors of the Ma & Pa. Many local trains worked in and out of Bel Air as well as considerable milk traffic from Delta, Pa., on the Pennsylvania border, thorough Bel Air towards Baltimore. A large amount of express traffic and 16 passenger trains per day added to the importance of Bel Air at the height of operations on the Ma & Pa. Three million passenger miles per year was a testament to the subscription of the local communities to this railroad over the years, considering that the average trip was only 30 miles, working out to about 100,000 passengers per year. Grain elevators in Bel Air provided local farmers with a focal point for deliveries of wheat. Farming being a major factor in the growth of the region as well as the railroad. As was true in the history of most other railroads in the United States, the advent of the state road system marked the end of passenger service as well as a decrease in freight traffic. This was true as well for the Ma & Pa, reducing passenger trains in the 1930s and bringing the service to an end in 1954 with the cancellation of the mail contract which was then awarded to a trucking company. By this time freight traffic was predominately in the Pennsylvania portion of the line; the Maryland division handled mainly milk and passenger traffic. Due to the imbalance caused by the elimination of passenger service the Maryland Division was abandoned in 1958. The post 1958 version of the Ma & Pa barely resembled the vision of 1901 and the Ma & Pa would never return to Bel Air. 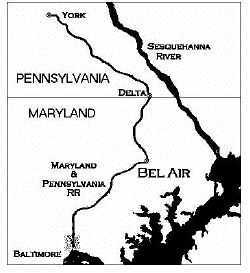 The railroad roots of Bel Air go back to 1867 when the Maryland Central was chartered to run from Baltimore to Philadelphia via Bel Air, but alas, no track was laid at that time. After three more failed attempts the Baltimore and Delta Railway started construction in 1878, reaching Towson (milepost 7) to service the local slate and milk market. The B&D merged into the still extant Maryland Central and completed the line through Bel Air to Delta (milepost 43.8) in 1884. The Maryland Central completed the construction of the Bel Air depot in December of 1883 in preparation for the completion of the line. Rail service had finally arrived to Bel Air. The Maryland Central was built as a narrow-gauge line in order to interchange with the Peach Bottom Railway at Delta. By 1889 the MC gained control of the line from Delta to York and started through-freight service between York and Baltimore. In 1891 the line was again merged, and now called itself the Baltimore and Lehigh Railway. After only two years the B&L was in bankruptcy and over the next eight years the Maryland end of the line limped along, still running narrow gauge, as it could not afford to convert to standard. The Pennsylvania end was under different control, had better financing and therefore converted to standard gauge in 1895. In 1901 when the Maryland & Pennsylvania Railroad was formed the Maryland end was finally converted. The Bel Air depot was Georgian in style and was built using Western Maryland Railroad plans, listed as WM2-W102. I am not sure if the first floor wing was an addition or part of the original plan,. My guess is that it was an addition. The first floor of the depot was used for business purposes; the second floor housed the station agent and his family. The depot was a focal point in the town long after the end of passenger service, surviving three years past the demise of the Ma & Pa itself. The depot was removed in 1961 to make way for more automobiles, becoming a parking lot expansion for the Southern States Co-op. The usefulness of the depot lost to the automobile, only to have them parked where it stood after its death, a sight all too often seen across America. 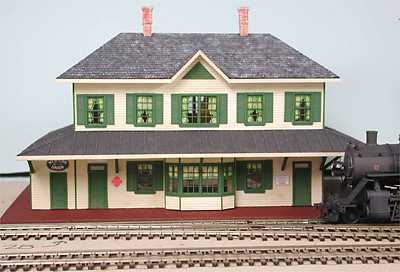 The plans for this model were purchased from the Maryland and Pennsylvania Railroad Preservation & Historical Society, 219 Princeton Lane, Bel Air, Md. 21014 (www.arrowweb.com/Ma&Pa/). I am not sure if these plans are still available as they do not appear on their website. You might try to contact them directly if you are interested. This model will reside on Larry Wrights Beaver Valley and Pennsylvania Railroad in the town of Sherylton. The BV&PA is loosely based on the Ma & Pa, with all the flavor of the Ma & Pa but located in Western Pennsylvania and eastern Ohio. Besides being an excellent example of great modeling, Larrys railroad is a testament to what is available in this hobby for modeling the Ma & Pa. Engines, cars, structures and a wealth of information is available for anyone interested in modeling her. Nearly every steam locomotive on the Ma & Pa roster has been produced commercially in brass. The Maryland and Pennsylvania Railroad Preservation & Historical Society is your place to start  first class! The small size and interesting variety of trains along this line make it perfect for modeling, or in Larrys case, adapting their equipment and practices to a railroad modeled after a place from his childhood. The BV&PA depots are green and white and therefore this model was also painted to meet his railroads requirements. I am not sure of the color of the prototype, although I am sure it is close. Twenty-tree windows must have made the interior of this structure very bright. It makes for an interesting dilemma, as there are no available windows that match the plans. Not wishing to construct 23 windows from scratch I found a Grandt Line set that match the design but were 10 percent larger than those found on the Bel Air depot. To solve this problem I decided to increase the overall dimensions of the depot by 10 percent to compensate for the larger windows. The proportions of the structure remain the same, so it would be quite hard to notice the difference unless you actually measure my model. It seems a small compromise to build it a little bit larger instead of building 23 windows and 46 shutters, I shuttered at that idea. Grandt Line doors were also chosen to match, again 10 percent larger than the prototype. The windows and doors were painted Poly S Depot Green. 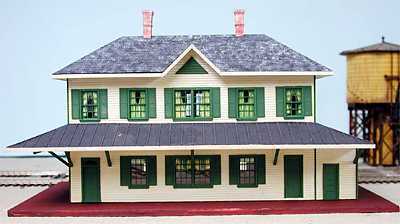 The walls were constructed using Northeastern Scale Models Clapboard siding (basswood). I built the walls as full sections (both floors), attaching them to form the structure. I completed the installation of the first floor windows and doors before gluing the walls together. The ceiling of the platform roof was built as one piece and slipped down to its final position past the second floor. This allowed for a very sturdy surface to build the roof proper. The second floor windows were left uninstalled until after the completion of the platform roof, to allow for the ceiling section of the roof to slide down the wall without interference from the windows. The walls were painted Refer White and then Antique White was dry brushed to the parts of the walls that would be exposed to direct sunlight, to give it a faded look. The platform roof covering was built using single-ply toilet paper applied to basswood, which was glued using diluted glue brushed on the paper to hold it in place. This takes patience and a little practice to keep the paper in place while you brush on the watered down glue. It makes for a snug fit that very closely resembles tarpaper. I made sure the paper extended beyond the roof so I could trim it to fit when it all dried. And you must wait for it to dry. 1x2 basswood strips were then added to secure the tarpaper as was done on the prototype. The entire platform roof was then painted flat black. For the second floor roof I used Campbell shingles, which were painted flat black and then dry brushed with Refer White and Roof Brown, to give the shingles texture. The building was next trimmed out, with all the trim being painted Poly S Depot Green to match the windows and doors. Roof supports were added to the platform roof and the depot signs for Sherylton were finished last. This was an interesting project as I learned quite a bit about a railroad I knew little or nothing about. I find that half the fun in building a project like this is the research to find out more about what I am building and meeting fellow modelers and railfans in the process. It brings the structure to life and gives it a personality. So for your next project, dont just build a structure, bring it back to life. Thank you to Larry Wright for suggesting this depot and for providing the plans to work from, I hope you enjoy it as much on your layout as I did building and researching it. Thanks, too, to Greg Halpin at www.railroadsofyork.com for allowing me to publish some of his fine photos of the Ma & Pa and Maryland Central. Stop by his site to view other classic shots from the Ma & Pa as well as other railroads from this region of the country. Thank you as well to Stewart Rhine, Archivist/Historian for the Ma & Pa Preservation & Historical Society for his help on the history of the Bel Air depot as well as other related history from their website. Just goes to show what e-mail and a search engine will find you these days. Researching your favorite prototype is just a keystroke away.